While we do have a beautiful line of custom, made and manufactured in North Carolina Wesley Hall upholstered goods that we proudly sing the praises of for its fine craftsmanship and quality we also deeply appreciate the quirks, character, and uniqueness of a one-of-a-kind vintage finds or the story line behind sentimental, inherited furniture pieces as well. Sometimes a piece has such distinct lines or silhouette or such a special back story and heritage that it is only fitting that it receive a custom upholstery makeover with designer fabric to transform it into a true Cinderella story, the showstopper, the piece de resistance for the space. This particular mid-century wing back with its distinctive lines and butterfly “wings” that curve around to give you a dramatic and cocoon like seating option while allowing peek-a-boo glimpses at the side and back panels was made and meant to be the stand out in any room. A vintage find at a thrift store this chair had so much potential we couldn’t wait to get our hands on it and select some gorgeous fabrics to really highlight the unique frame. 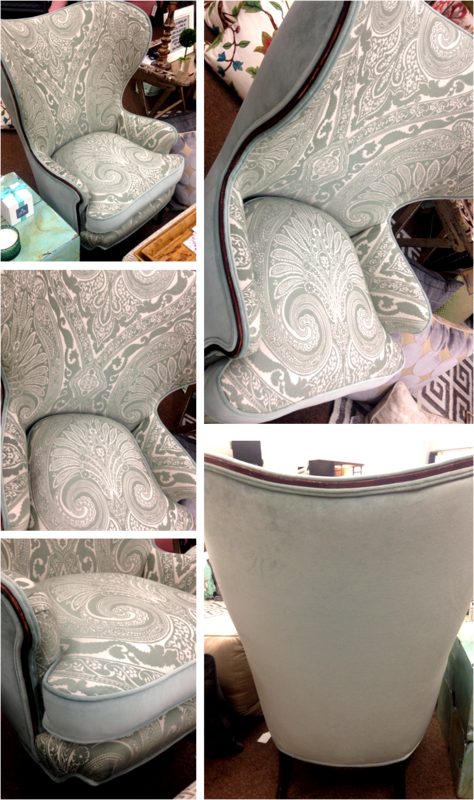 A soft aqua blue velvet was selected for the back, seat cushion boxing, and contrast welt and this unique paisley inspired medallion featured on the front was absolutely made to compliment the lines of this chair- just look at how the scale of the print gently swoops with the lines of the piece! We could not be more thrilled with how this showstopper turned out! Do you have a vintage find or an inherited piece of furniture that you are wanting to reupholster? We have talented designers on staff to assist you in selecting the perfect fabric, or combination of fabrics to highlight its unique look and feel and a list of wonderful local upholsterers to help you in your transformation process!